There are an awful lot of people waiting to get their hands on the Nokia Lumia 900, a Windows Phone smartphone and the flagship device of Nokia’s current crop. This could be the handset that makes Windows Phone devices more popular and there’s good news if you’re in Canada as Lumia 900 buyers will be able to place pre-orders through Rogers from next week. AT&T for the U.S has still not confirmed a release date for the Lumia 900 but a few days ago we told how the rumored launch date of March 18 had been put back to April 22. 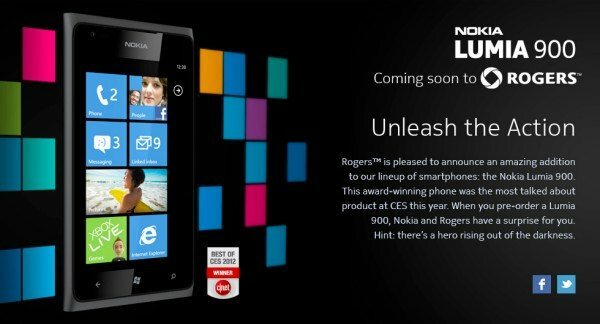 There’s no actual date listed yet for the Lumia 900 release on Rogers but Nokia did confirm previously that the LTE version of the Lumia 900 would hit Rogers in April. At least the carrier has now announced on Twitter that pre-orders will be open from next week so that will satisfy many potential customers. You can head to this Rogers registration page here to sign up and be told when pre-orders begin and as an extra you’ll see that there’s a teaser. It says that if you pre-order the Lumia 900, Nokia and Rogers have teamed up with a surprise for you and the hint is ‘there’s a hero rising out of the darkness.’ As Engadget points out, this is obviously something Batman themed but quite what is anybody’s guess at the moment. In case you need a reminder about the Nokia Lumia 900 we’ll tell you that it’s a beautiful looking handset with a 1.4GHz Scorpion processor, 4.3-inch WVGA AMOLED ClearBlack touch display, 512MB of RAM along with 16GB of internal memory. The camera will appeal to many as there’s an 8-megapixel rear camera with Carl Zeiss optics, 720p video capture capability, dual LED flash and auto focus as well as a 1-megapixel front-facing camera. It runs on the Windows Phone 7.5 Mango operating system. There’s no price availability yet for the Lumia 900 on Rogers but you can bet we’ll find out very soon when those pre-orders open. If you want to find out more about Windows Phone 7.5 Mango then you can check out a video that we’ve embedded below this story that shows an overview of this OS. Will you be purchasing the Nokia Lumia 900? If so what has drawn you to this Windows Phone device? I’ve been waiting for word from AT&T or Nokia as I regsitered to preorder right after Lumia 900 was announced. Nokia needs to speed up the time from product announcement to actual ship.